MSV: Grist for the Mill: Why did Ravi Bhalla throw speakers out of a council meeting? Grist for the Mill: Why did Ravi Bhalla throw speakers out of a council meeting? In October 2015, the last City Council meeting before the election saw then City Council President Ravi Bhalla throw out two well known Hoboken politicos. The first, Perry Belfiore is a long time Bhalla nemesis and DeFusco backer who is hunting Ravi Bhalla conflicts and filed an ethics complaint in 2010 about Bhalla sharing an office with another law practitioner. The second, David Liebler was a backer of anti-Administration Old Guard candidates and supported the Vision 20/20 redevelopment proposed by the always controversial Carmelo Garcia. According to a well placed source, the people thrown out of the meeting was decided in advance of the City Council meeting. Earlier that day, a story appearing on PolitickerNJ recounting emails between the mayor's husband, Stan Grossbard and members of the Hoboken Housing Authority board. The source, an eyewitness to the drama was astounded as others present by the rash action taken at the council meeting. Perry Belfiore referenced the PolitickerNJ story mentioning the mayor's husband and was promptly booted with the aid of the police. He would later file a lawsuit and settle with the City of Hoboken for an amount north of $50,000. David Liebler also filed a lawsuit against the City of Hoboken and his civil lawsuit is pending. He was well along in his remarks with less than 20 seconds remaining when he got the boot for his late mention of the mayor's husband. He seemed unaware Belfiore had been kicked out earlier. While Mayor Zimmer did an enormous amount of good for Hoboken, she's made some mistakes along the way, the Washington Street "detonation" being the most visible of late. This protective move was probably a heated reaction to the leaking of documents to PolitickerNJ which wrote a story about the Carmelo Garcia "Ethnic Cleansing" lawsuit earlier the same day using emails obtained in the litigation. More recently, Mayor Zimmer has been throwing darts below the belt at City Council President Jen Giattino. Her unfortunately timed letter attempted to denigrate Giattino on her not being "sure" projects would be completed, one being Rebuild by Design. The mayor's letter went out to Hoboken residents after the federal government released $230 million in funding for the project and Jen Giattino who backed the mayor every step of the way publicly extended congratulations to Mayor Zimmer and all involved. Yikes! Another version of the letter emailed yesterday attempted to tone down the obvious inconsistency and the charged negative attack. Some contrast the two as part of residents' negative reaction with the political play as the mayor winds down her second term. 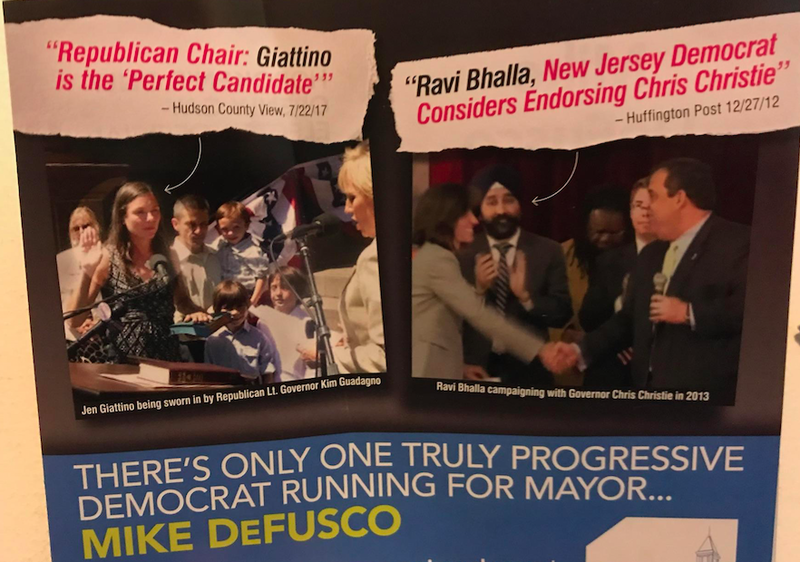 Councilman Mike DeFusco in a new mailer opted not to be left out of the hyper partisan sweepstakes in Hoboken's distinctly non-partisan election. He's been taking shots at his rivals Jen Giattino and Ravi Bhalla of late but this has the flavor of party partisanship the Bhalla campaign has sought to utilize or perhaps exploit would be the better term. One photo shows Jen Giattino being sworn-in on July 1, 2011 as a caption notes praise for her by a chair of county Republicans. The other photo shows Councilman Ravi Bhalla with Mayor Zimmer and Governor Chris Christie and points to Bhalla considering an endorsement for Christie for Governor. Another article had appeared on NJ.com where Bhalla weighed endorsing Gov. Christie for re-election leading into the 2013 election. At the time, Christie stood in a strong political position and many Democrats were happy to hug his coattails. The photo with Chris Christie is not the best. Another photo of Councilman Ravi Bhalla with Chris Christie showed the two far more congenial back in April 2013 for a Hoboken event at the Boys & Girls Club sponsored by the NFL. The appearance by Governor Christie and the NFL saluted the floor rebuilt after flooding and a program advocating kids getting physically active. The combination of the two led to something of a mosh pit for the media and public in attendance. At the time, Councilman Ravi Bhalla was gearing up for his second run for NJ Assembly, a position he sought in the 2011 election but lost to Ruben Ramos. Later Councilman Bhalla would rethink the second attempt against Carmelo Garcia and withdraw. However, implicitly seeking any support from the then popular governor seemed a good political decision for advancement at the time. Today, with four major mayoral campaigns, divisive partisan pandering holding up Hoboken to a national light is seen as a good strategy. A week before election day, Bhalla's controversial negative attacks focused against Jen Giattino are more radioactive than uranium being shipped out of the US. Hoboken will only need to wait a week to see how the selective politically poison pill of partisanship fares. 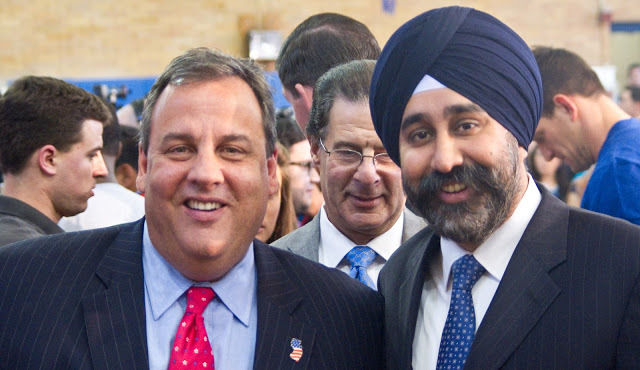 For now here's a better picture from the 2013 event when Ravi Bhalla sought a picture with Governor Chris Christie. Partisanship, what partisanship? A photo of Governor Chris Christie and Councilman Ravi Bhalla in 2013. Bhalla was a second time Assembly candidate at the time who later withdrew from the race. One last rare personal note. Many are coping with the Reform divide. You're not alone. However the truth shall set you free or if not, the calendar will in a week. Many of us are disappointed in how politics and power has been put up above all by some. The stakes are personally high with hundreds of thousands collected and being expended. However, Reform principles have not changed. Transparency trounced, back room deals and flooding the zone with pay to play PAC interests should not prevail. Please act accordingly on November 7th. That's the best way for Hoboken citizens to be united.